With passthrough power and both HDMI and VGA, it might be the best USB-C hub for a road warrior. Business travelers used to rolling up into an unfamiliar conference room or presentation venue need to be able to plug in to whatever video option is available. 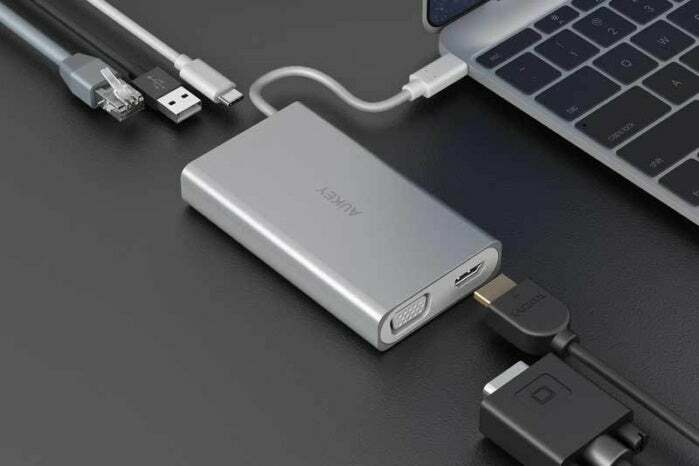 The Aukey Multiport USB-C Hub ($100 on Amazon) brings VGA to a robust compact dock solution. It comes with a seemingly hefty price tag, but by offering a choice between HDMI and VGA while incorporating passthrough power and several other ports, the Aukey unit offers the greatest flexibility for the road-warrior presenter. You’ll still need a DVI to HDMI adapter, but that’s it. The handsomely-designed multiport hub has a brushed aluminum case and easy access to the whopping six ports on its compact frame. In addition to 4K at 30Hz HDMI support and 1080p over VGA (with capable monitors), it also includes passthrough USB-C power (no USB-C data), two USB 3.1 (5 Gbps) Type-A jacks, and gigabit ethernet. Its 4-inch USB connector tail is integral, which often makes me nervous, as if it’s damaged at the dock side the unit has to be repaired or replaced. However, it’s also easy to lose short USB-C host cables, too, making the integral cable one fewer thing to worry about. The Type-A ports are a little underpowered at 5V at 500 milliamps (2.5W) and 900mA (4.5W). That’s below the typical charging rate for iPhones and way below an iPad’s base recharge rate (10 to 12W). However, for a compact adapter, heat dissipation is a real issue, so it’s one of the tradeoffs. 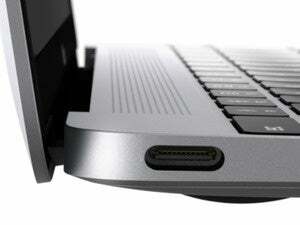 The 500mA port might also not work with bus-powered USB 3 drives. I tested an SSD drive, and it worked fine on the 900mA port, but showed only a power light and wouldn’t mount via the 500mA one. The drive did, however, test out fine at its maximum rate of 300MBps write and 420MBps read. Gigabit ethernet, HDMI, and VGA tested out perfectly fine as well. The VGA connector lacks screw holes—there’s no room for them—and VGA plugs can be easily dislodged. When using VGA, you’ll need to make sure the hub won’ get jostled. Or bring some heavy-duty rubber bands for a makeshift solution. VGA and HDMI cannot be used simultaneously. It’s an either/or situation, and HDMI takes precedence when both jacks are in use. 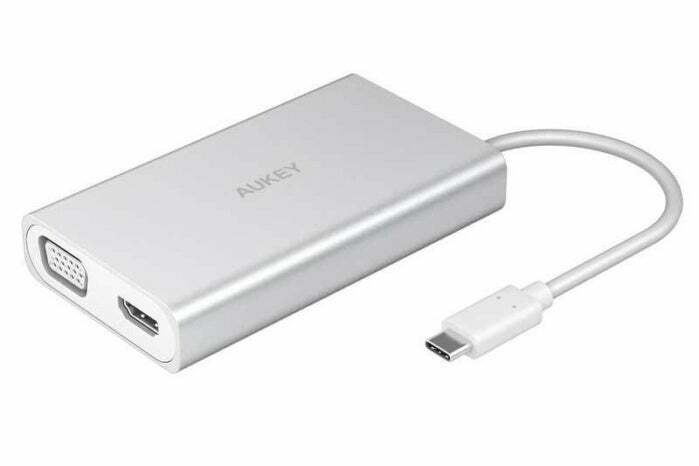 At $100, the Aukey Multiport USB-C Hub might seem overpriced, but VGA doesn’t come cheap. On other compact adapters that include VGA, you pay $50 to $80 for just VGA, passthrough power, and a single USB 3 Type-A port. If you need VGA and want the option of HDMI in the same dock, as well as other ports, the Aukey is an easy choice. Passthrough power, two video output styles, two USB 3.0 Type-A ports, and gigabit ethernet combine to make it a compact powerhouse.